It doesn’t matter if you’re an AVL technician, mobile entertainer or integrator a reliable power supply for all your equipment is essential to ensure every performance goes off without a hitch. That’s why the team at ADJ have developed the POW-R BAR65, a pro-grade power utility block designed to supply safe, reliable electricity to all your gear. The POW-R BAR65 is fitted with six surge-protected 3-prong AC Edison sockets arranged with plenty of space between them to allow for chunky plugs and adaptors. It features a large illuminated master power switch and is fitted with a professional powerCON input socket. The unit is supplied with a heavy-duty 6-foot cord with a powerCON connector on one side and a standard 3-prong Edison socket on the other, although it can also be used with longer powerCON cables, which makes it a flexible power distribution tool. The POW-R BAR65 is designed for Front of House and lighting control desks, club and mobile DJ rigs, computer work stations and studio spaces. Offering a high maximum AC output current of 15 amps, and an operating voltage of 120V, the unit is capable of providing power to a wide variety of professional sound and lighting equipment. It offers line to neutral spike protection, guarding against a surge current of up to 6000 amps, as well as a circuit breaker built-in to its on/off switch. 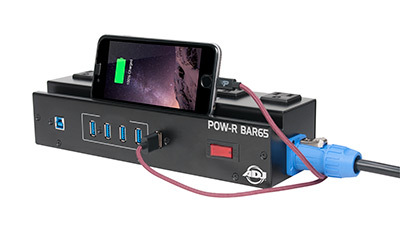 In addition to its mains power distribution capabilities, the POW-R BAR65 also integrates a 4-port USB hub. This can be used to provide a reliable electrical supply to USB-powered equipment and instruments, as well as for providing a data connection between computers, hard drives, and control hardware. It offers four USB 3.0 type A sockets, for peripheral devices, as well as a USB 3.0 type B socket for the connection of a PC. All USB ports are "live" for charging whether thre is a hub attached or not. A further 2.1A USB type A connector is provided specifically for charging a mobile phone or tablet. The unit’s case has also been cleverly designed to incorporate a recess that forms an angled shelf on which a mobile device can be placed during charging. The POW-R BAR65 has a heavy-duty metal construction designed to withstand the rigors of the road. It not only looks more professional that a standard plastic power strip, but it is also much safer. It is a robust, yet easily transportable, unit that measures 10.5” x 3.25” x 2.5” / 264 x 80 x 65mm (L x W x H) and weighs 2.5 lbs. / 1.1kg. If you’re a mobile DJ, the POW-R BAR65 is ideal for powering up your equipment as well as connecting together your laptop, external hard drive, and MIDI controller. Meanwhile, if you’re a technician, this professional-caliber electricity distribution tool is equally suited for use at front of house as it is on-stage for proving backline power. With a retail price of just $79.99, the POW-R BAR65 is an affordable tool for providing safe, reliable power to your equipment, either out on the road or as part of a permanent installation. 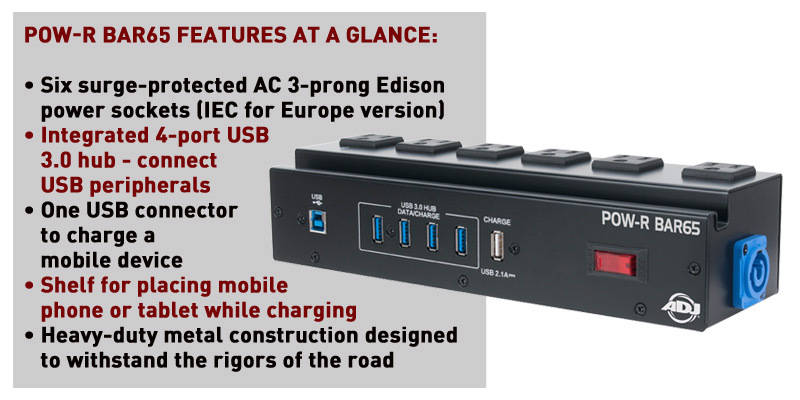 It’s USB hub also makes connecting up digital equipment simple, while it’s dedicated mobile charger point means that your phone will never run out of batteries while you’re working! Protect your equipment, as well as yourself, by adding an ADJ POW-R BAR65 into your equipment setup. It is not only safer than a cheap plastic power strip, but it looks more professional and is built to stand up to the rigors of the road.This product is ETL approved in the US and Canada. The POW-R BAR65 is available now from ADJ USA.